The first time I had KFC (Korean fried chicken, not Kentucky) was in New York about seven years ago. I led Mike on a merry chase around the city visiting random Korean joints that smelled deliciously of deep fried goodness. Our chicken adventures took us to shady, hard to find karaoke bars and actual Korean chains from Korea. At first Mike thought I was a little obsessive, but after that first bite into that sweet and spicy double fried crunch, he was a little obsessed too. 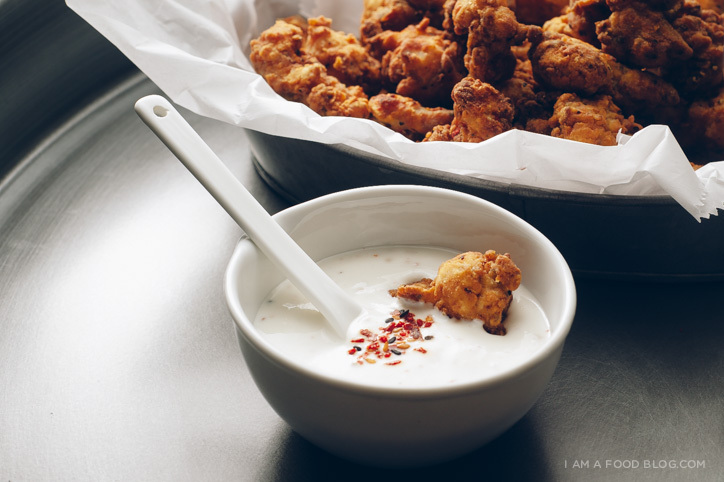 These little popcorn bites aren’t technically Korean fried chicken – I didn’t fry them twice. 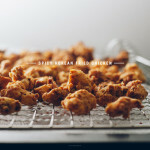 Nope, these guys are basically popcorn chicken (I LOVE popcorn chicken) tossed with spicy Korean chili seasoning. They’re super crunchy due to a triple dip – flour, then buttermilk, then flour again. It’s the middle of Summer and I know you guys are all salads and popsicles all day, but guys, this chicken is worth hanging out at the stove. It’s crispy, spicy, bite-sized, and delicious. It tastes good right out of the oil or after it’s cooled down to room temp. It even tastes good cold, especially when you dip it into some homemade spicy ranch. I collaborated with Season with Spice for this post! They have some truly awesome spices! Mix the chili flakes, garlic powder, salt and pepper together in a large bowl. Add the chicken and mix well, so all the pieces are seasoned. If you have the foresight, do this overnight. If not, a good hour should do the trick. In a shallow bowl, mix together the flour, chili flakes, pepper and garlic powder. Pour the buttermilk into a shallow bowl. Set up a large dish or tray (big enough to lay out the chicken pieces in one layer). Dip the chicken pieces into the flour mix, then the buttermilk and back into the flour mix. Double coating ensures extra crispiness. As you coat, lay your coated pieces on your dish/tray. Let the chicken rest while you wash up. Resting lets the flour and buttermilk crust up for extra crunch. Place a cooling rack over a rimmed baking sheet lined with paper towels. In a deep-sided pot, heat up 2 inches of oil (I like to use grapeseed, rice bran or sunflower) over medium to medium high heat until it reaches 350°F. Fry the chicken pieces, being careful not to crowd the pan, until deeply golden brown and crispy, about 5-6 minutes. Drain the chicken on your prepared rack. Continue frying until all the chicken is cooked. Toss in a bowl with the spicy Korean chili seasoning and enjoy with spicy ranch dressing. 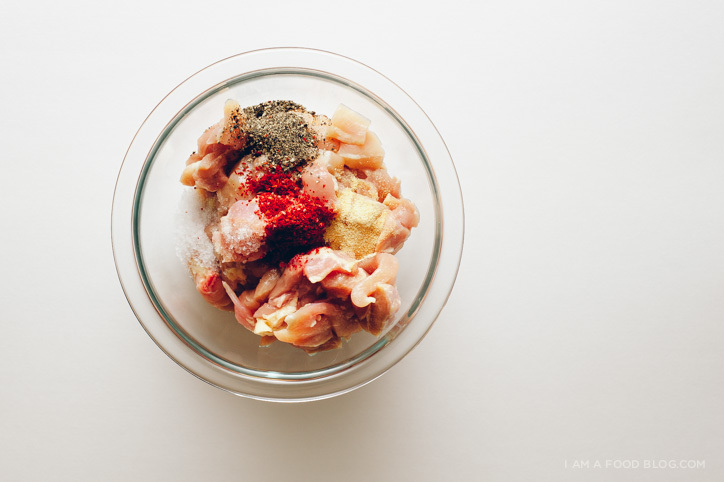 Mix the first 5 ingredients together in a small bowl. Taste and season with salt and pepper. Love this and the last shot is awesome! Got to try out korean fried chicken, I am slightly obsessed with kara-age! mmmm karaage is SO GOOD! YEEEESSSSSS This looks incredible! I wonder if this recipe would work with (GASP) tofu? I have never seen KFC at restaurants in my area. I want to try it! Thanks for posting this recipes so I can!! hope you get a chance to try it out janel!! thanks for dropping by! 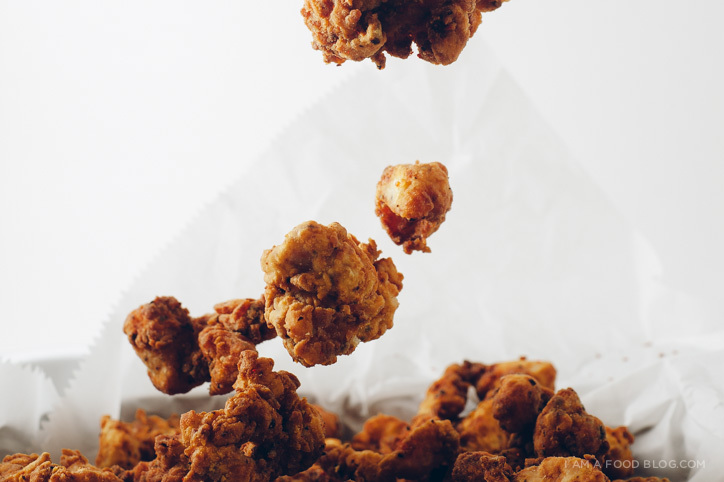 OMG, KFC popcorn chicken. Whutttt. Amazing. Fried chicken is definitely summer food too! It is what you eat before all the popsicles and whatnot. And especially with the spicy Korean seasoning. Had no idea traditional KFC is double fried too. However, are Korean chili flakes different than regular chili flakes?? korean chili flakes (gochugaru) are different – they’re sweet, smoky, spicy and coarsely flaked. it’s what they make kimchi with! you can substitute with regular chili flakes, but it won’t be quite the same. I’m with Athena — inquiring vegetarians want to know :) Would tofu would be good like this? I don’t miss meat often but sometimes when I think about eating wings in Koreatown with my sister in New York, I get a little misty-eyed. You photographed this beautifully, Steph! Especially love that shot second from the bottom! you could even skip out on the battering part and just deep fry then toss. this is nothing compared to real KFC though. you’ve got to try it someday! I LOVE YOU! This is my all time favorite snack. GIMME! This looks freaking amazing! I’m going to put it on everything, salads AND popsicles! OK, just the salad. And dipped in ranch. ooh, yes, on a salad!! that’s genius. and the ranch. it’s not traditional, but it’s SO good! 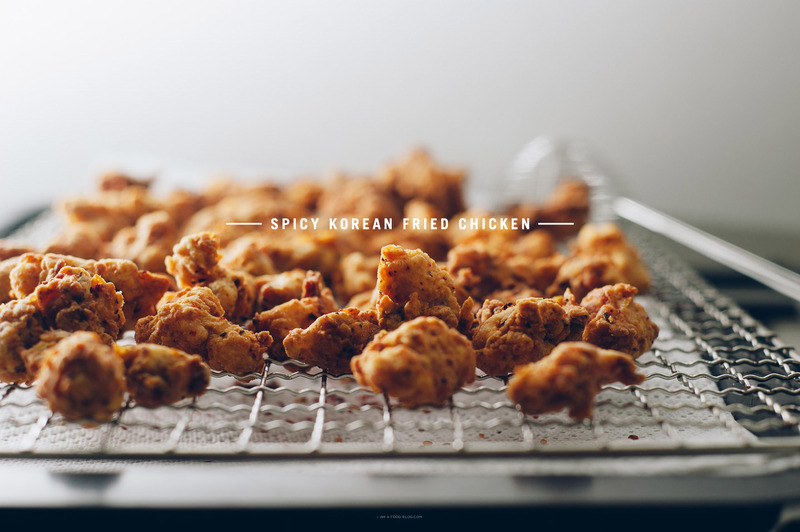 As a half-korean girl and lover of all things fried chicken…this is totally singing my song!! Brilliant! I love popcorn chicken as well. Just never thought of doing it Korean style. Hi what is the flour mix? I think I just gained 20 pounds ….. of happiness! I have so been wanting to try Korean food. I have to travel at least 2 hrs to the nearest possible restaurant, but it is on my list. I am jazzed to have a recipe for this chicken dish. Yahoo! 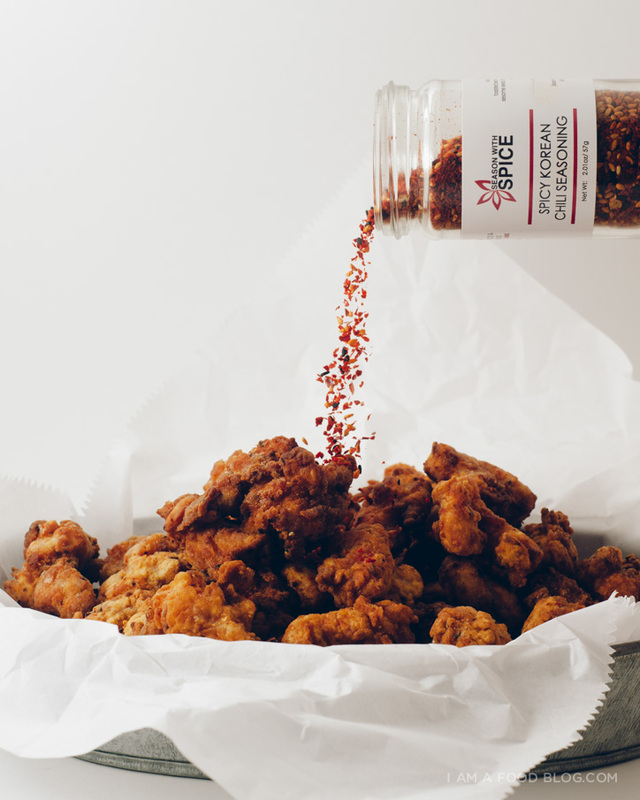 Spicy and crunchy– the best way to eat chicken! I’ve got to agree with the rest of the commenters.. that last shot is fantastic! Just stumbled on your food blog – one hell of a way to start! This chicken looks amazing, I’m going to have to give this one a try. u think i can bake this KFC? I haven’t tried baking it – it may work, but you won’t get as much crispiness. 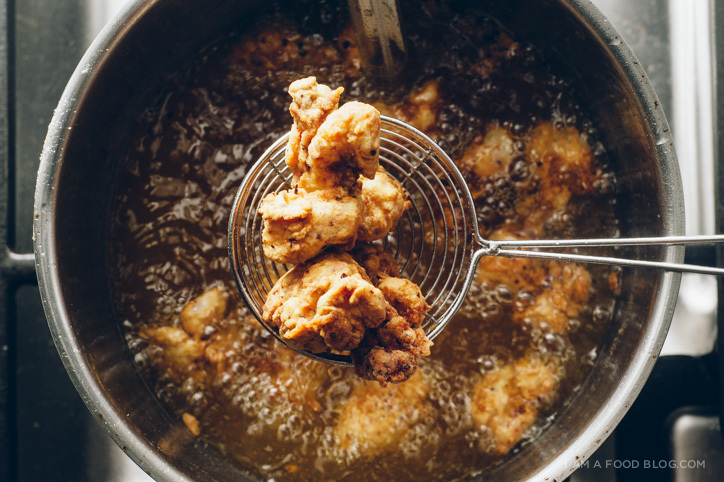 What do you usually do with all the oil after you fry the chicken? As much as I’d love to try fried chicken from home, it sounds like a lot of oil to part with for one recipe. …Unless I go on a deep fry marathon! Go on a deep fry marathon! Usually I just discard the oil. I know it’s a lot of oil, so generally when I know I’m going to deep fry I’ll do more than one thing. Also, if you use a deep, deep tall pot, you won’t have to use as much oil, but you will need to fry in very small batches so the oil temp doesn’t change too much when you add the chicken in. Make sure you don’t fill the oil too hot though, because it can overflow!